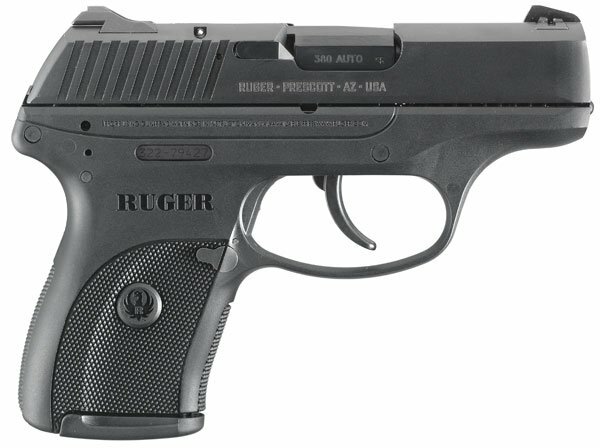 The Ruger LC380 (Light Carry) handgun is chambered in .380ACP and is made for deep concealment or pocket carry, as is its predecessor, the Ruger LC9 in 9x19mm (introduced in 2011). A side-by-side comparison shows the two, the LC9 and the LC380, to be identical. From the accompanying insert to the owner’s manual: “…the Ruger LC380 has the same basic operational characteristics as the LC9 pistol.” This is correct – to a point. 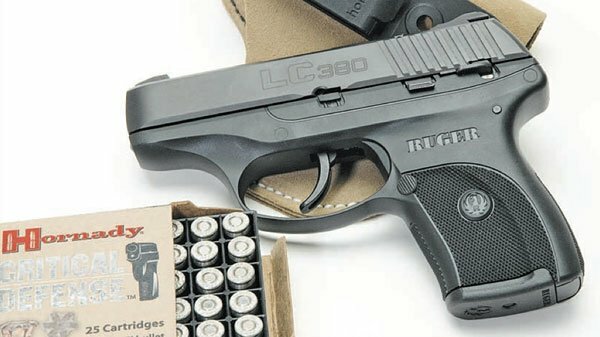 The new LC380 is semiauto and double-action-only. It has a blued, through hardened (fully heat treated) slide and uses a linkless barrel locking/ unlocking system. Its outer frame is black colored, glass filled nylon (aka polymer) with an inner metal frame. The LC380 weighs 17.2 ounces with an empty magazine; is six inches long, with a height of 4.5″ and a width of .9″; and it has a 3.12″ barrel. The magazine’s capacity is seven rounds, plus one in the chamber, for a total capacity of eight rounds. As mentioned, the frame is actually two frames with an inner metal chassis which contains the firing system and the outer frame, or shell, on which the slide travels and on which the chassis is secured. As this latter unit is considered the “gun” portion, it is serial numbered, with this number visible through an opening in the polymer frame at the top of its right grip panel. The sights are windage adjustable in dovetail cuts in the slide; the rear sight is further secured with an Allen screw. The wide (1.63″) square cut, rear sight notch with two white dots on either side, when combined with the 1.25″ single dot wearing front sight, makes for coarse, but quick, sighting. These sights are large enough to give a good sight picture. Barrel lockup is via the chamber hood abutting into the large ejection port window. The pivoting external extractor is located at the lower right rear of the port and a centrally mounted, mechanical loaded chamber indicator is at the rear of the ejection port. 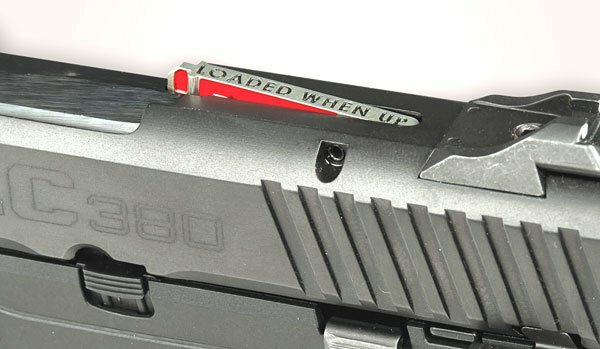 When a round is chambered, this indicator rises at its front from the body of the slide and is thoughtfully marked “loaded when up.” It also displays red epoxy paint on either side. Inside the slide is a passive firing pin safety which is to the rear of the ejection port. Eight wide diagonal grasping grooves are at the rear of the slide. These begin at the rear of the ejection port and end at the forward angled rear of the slide. A spurless external hammer lies within an opening at the rear of the slide and at the top of the backstrap. The slide is nicely tapered at its muzzle and along its bottom edges. The Ruger LC380 has a loaded chamber indicator. The metal chassis is secured with two pins through the polymer shell, with one up front and the other to the rear of it. An additional upper rear pin, also in the outer frame, holds the spurless hammer. The slide rails are molded into, and run the full length of, the top of the frame. A nicely curved backstrap allows the web of one’s shooting hand to be well under the area of slide movement. The lower portions of the backstrap and front strap have molded checkering. Thumb grooves are on both sides of the finely checkered frame walls and aid in getting a good grip on the pistol. The nonambidextrous magazine catch is vertically grooved on its pressing surface and well protected from accidental release by a raised portion of the frame partially surrounding it. A large and rounded trigger guard allows for quick and sure access to the smooth faced, curved and hinged, double-action polymer trigger. The trigger pull measured seven pounds. The long, smooth trigger pull made the seven pound pull weight manageable. The trigger action does require allowing the trigger to run fully forward before it is ready to fire again. In essence, shoot it as you would pull the double-action trigger of a revolver. The slide catch is centered above the grip area on the left side of the frame. To the rear of the slide catch is the thumb safety which is partially grooved. When the safety is moved down or “off safe,” a red oval on the frame is exposed. When moved fully up, or “on safe,” a white oval is exposed. The safety moves in a positive manner while remaining easy to use. The grooved slide lock is just a bit forward of the thumb safety. You can apply the slide catch by first pulling the slide fully rearward while applying upward pressure on the slide catch until it engages and locks the slide to the rear. To release the slide, pull rearward on it while depressing the slide catch. It appears to me that the catch is not designed to simply be depressed to release the slide. I think doing so will quickly accelerate wear or even quickly damage this part. The slide locks open on an empty magazine. The LC380 has a magazine disconnect which prohibits the pistol from firing until a magazine is fully seated. 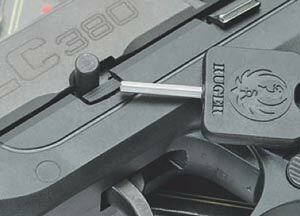 The LC380 has an internal gun lock with a keyhole at the top right rear of the frame. To engage the internal lock, apply the manual safety which can only be done when the pistol is cocked. With this done, insert one of two supplied keys into the small keyhole and rotate the key clockwise one fourth of a rotation. To deactivate, rotate the key counterclockwise the same one fourth of a rotation. When the lock is engaged, the trigger will move freely, but will not function. To disassemble, after insuring that the gun is empty and the magazine is removed, press down on the takedown plate and, using the internal gun lock key, push out the takedown pin from the right side of the frame and remove. Note: You can only remove the pin if the semicircle notch on the slide is aligned with the circular top of the round pin. The slide assembly can now be moved forward off the frame. Next, slightly compress the dual recoil springs on their polymer guide rod and remove. Move the barrel slightly forward, as doing so allows the barrel to be lifted up and out rearward. Further disassembly is not necessary or advised. Note: The following data was obtained using a Pro-Chrony chronograph at 300 feet above sea level with an ambient temperature of 78 degrees. 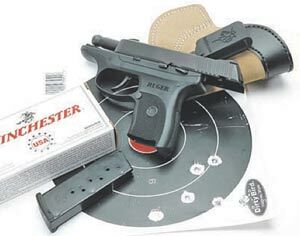 The pistol used was a Ruger LC380 with a 3.12" barrel in .380 ACP with five-shot averages. they’ve shot almost all of this caliber pistols I’ve had for T&E over the last few years, this is high praise indeed! For more precise shooting, the sights of the LC380 are large enough and the rear sight notch is wide enough (as noted earlier) that the sight picture has lots of light visible on both sides of the front sight, enabling you to fully use all your marksmanship skills – even in dim light. As far as a holster, I had the DeSantis Pocket-Tuk holster on hand and it looks to be a good match for this pistol. The Pocket-Tuk can be used either as a pocket holster or an inside the pants belt rig, as the holster is shaped such that it worked for me in a larger front pants pocket. I’ve had circumstances where I wanted to take off my suit coat, but I could not because my belt worn handgun would be exposed. With this rig, I could easily move the package to a pocket where, given its outline, it would also offer good concealment. As to why you would choose this larger pocket pistol in .380 ACP over a smaller model, it’s pretty simple. Larger guns are easier to shoot well and, weighing more, have less felt recoil. Also, for those with large hands, just managing to pull the trigger of some of the mini pistols is a struggle at best. And, with an MSRP of just $449, it’s a good buy as well! About the Author: Upon receiving his BS degree from Carnegie Tech and completing service as a Special Agent in U.S. Army Intelligence, Walt Rauch was a Special Agent with the U.S. Secret Service and an Investigator with the Warrant Unit, First Judicial District, PA.
Rauch is also a writer and lecturer in the firearms field. He is published regularly in national and international publications. This article is a contribution from Police & Security News. P&SN is bi-monthly law enforcement magazine that is packed with training articles and gear reviews for the patrol officer. P&SN is a valued supporter of BlueSheepdog and the Blue Crew. You can obtain a free subscription to the Police & Security News magazine by joining the Blue Crew.